I know the stores started putting out Halloween about two months ago, but I am just so excited I can’t wait any longer. I always feel like I need to get Halloween Ideas for Kids squared away first because they can be so time consuming. Plus, there are so many amazing ideas out there that I want to get my Pinterest boards organized so that I know what I’m looking to get done. Speaking of Pinterest Boards, did you know that Whimsy Wednesdays has a group board that features all of you each week? Come check the Whimsy Wednesdays board out and follow along as Kelly and I take Pinterest by storm to show all of you off. 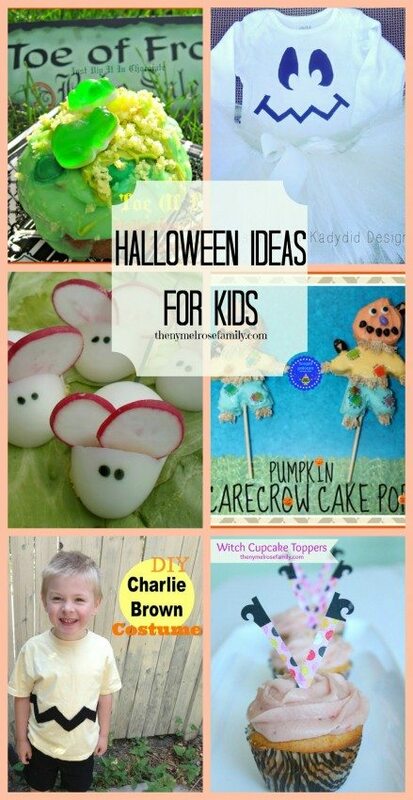 Love all of these ideas, and thanks so much for including my Halloween Cupcake ideas! That Charlie Brown costume is too cute. Thanks so much for including my Not So Scary shirts with all these other adorable ideas! I’m so pining this, i want to make something special for Emma and my little brother this year!! !